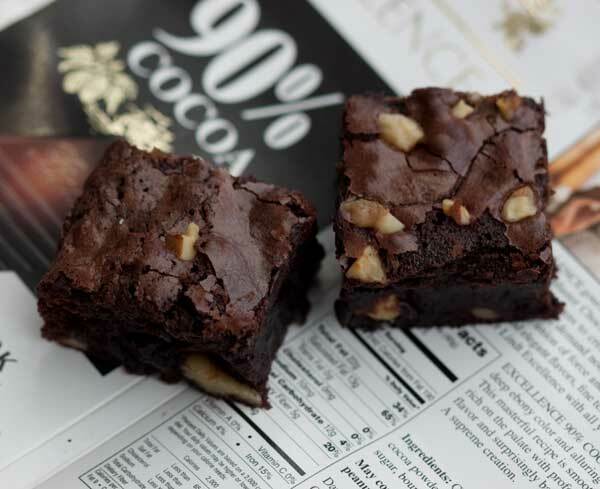 Walnut Fudge Brownies are made with a mixture of melted unsweetened chocolate and cocoa powder. Preheat oven to 325 degrees F. Line an 8 inch metal pan with nonstick foil. Combine the butter and chocolate in a microwave-safe bowl and heat at 50% power, stirring every 40 seconds, until chocolate mixture is melted and smooth. Alternatively, you can do this in a bowl set over water. Add the cocoa powder to the hot chocolate mixture and stir until smooth, then stir in half (3/4 cup) of the sugar. Meanwhile, in a second bowl, gently whisk together eggs, remaining ¾ cup sugar, salt and vanilla. Scrape the sugar/egg mixture into the chocolate mixture and stir until blended, then stir in the ½ cup of flour. Stir in the walnuts, then scrape mixture into the pan. Bake for 40 to 45 minutes or until brownies appear set. If you have a meat thermometer, check to see that they are around 210 to 212 degrees F.
Let the brownies cool at room temperature, then chill for a while before lifting from pan, cutting and serving.